“No, you don’t have to live inside my head. Greg Gaines has perfected the art of social invisibility. He knows everyone in all the typical high school social groups, but isn’t a part of any of them. He and Earl, his one and only friend, spend their days making obscure, terrible movies they refuse to let anyone watch. Greg likes his life standing on the periphery and is looking forward to coasting through his senior year. But when Rachel, an old friend from Hebrew school, is diagnosed with leukemia, Greg’s mom convinces him that he needs to step up and befriend her. As Greg is pulled further and further into a friendship with Rachel, and he and Earl agree to make a movie for her, Greg learns that invisibility might be an impossible life choice. narrator, is so hilarious (both intentionally and accidentally) that I was afraid to read the book in public for fear I would have to explain my stifled laughter. But in between the comedy, there are moments of brutal honesty and self-doubt that elevate Greg beyond the superficial. Greg is far from perfect, generally wrapped up in his own problems and unwilling to step outside his carefully constructed box, but likeable nonetheless. I particularly loved the writing styles Andrews uses. The novel is written in a mix of styles, incorporating straightforward prose, scripts (fitting, since Greg and Earl are amateur filmmakers), and bulleted lists. The writing doesn’t mince words and is often brash, but then, so is Greg. Reading this book felt like I was taking a peek inside Greg’s head: Abrasive, chaotic and sometimes (often) inconsiderate, yet haphazardly insightful and desperate to please. What I most appreciated about this novel is that it is a cancer book that doesn’t revolve completely around cancer. In fact, the cancer plot line takes a back seat to Greg’s struggle to accept the death of his social invisibility. Andrews doesn’t force you to feel all the typical emotions wrapped up in kids dying of cancer. There is sadness, yes, but it’s tempered by Greg’s inability to grasp the big cancer picture. Even when he finally does understand what cancer means for Rachel, the reader isn’t forced into gut-wrenching, all-encompassing misery. Nor is the book sappy and melodramatic, because let’s be honest: Brash, self-centered Greg is immune to sappiness. 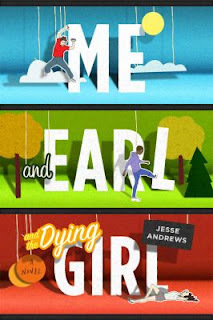 At its heart, Me and Earl and the Dying Girl is about a self-absorbed, awkward teenager reacting to difficult situations. Often, we are touched by unexpected challenges and our lives our forever changed. But, sometimes, we are like Greg, unable to process and unwilling to see how our lives could change or, more likely, have already changed. And, you know what? That’s okay, too.